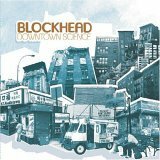 While I'm still unsure whether Blockhead is a reference to good ol' Charlie Brown, I will admit that this album got me offguard. It's been out for a bit and I've heard very little about it. Blockhead is a relatively new member to Ninja Tune, but he's developed some cred thanks to his work with Aesop Rock and other Def Jux affiliates. The music isn't really hip-hop and not really downtempo, it's somewhere between Boards of Canada and Boom Bip. He makes an interesting use of samples, even if they don't always work. Think of it as chill out music to nod your head to.